This post has been updated with another new poll, from CNN. President Trump's administration has taken the rather remarkable and controversial step of separating families who immigrated illegally at the border — a move that opponents decry as inhumane and are sure will backfire on Republicans during the 2018 elections. The reality is much more nuanced. And the whole thing seems as though it might be another example of a supposed “last straw” for Trump that simply causes his base to shrug. Quinnipiac University and CNN on Monday came out with the first good-quality polls testing the policy, and voters writ large were very much opposed. While the Quinnipiac poll showed voters opposed separating families at the border 66 percent to 27 percent, CNN showed them disapproving of the policy 67 percent to 28 percent. But most Republicans approved of the policy: 55 percent to 35 percent in the Quinnipiac poll and 58 percent to 34 percent in the CNN poll. And if past is prologue, support is likely to cement among Republicans as the administration presses its case and partisans dig in against Democrats and what they view as overzealous and overly critical news coverage. This has been the case when it comes to a border wall. The somewhat dormant idea caught fire among Republicans once Trump proposed it during the 2016 presidential election campaign. While 47 percent of Republicans supported building a border wall in a 2006 Gallup poll and 60 percent supported a border wall or security fence in a 2010 Fox News poll, support for it is above three-quarters today in most polls, including the new Quinnipiac poll. Trump has also transformed his party on issues such as free trade, moving it away from globalist policies into a more populist place. 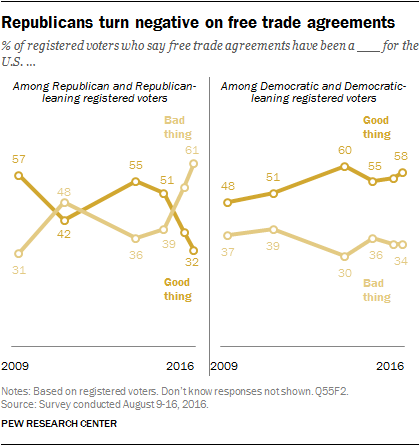 Pew and other pollsters showed a spike in GOP opposition to free trade — previously an issue on which Republicans were the biggest supporters — once Trump took up the cause. Republicans have also shifted in Trump's direction when it comes to refugees. Pew recently showed a 9-percentage-point drop in the percentage of Republicans who said the United States has a responsibility to accept refugees, from 35 percent in February 2017 to 26 percent today. Among conservative Republicans, the drop was from 33 percent to 19 percent. The counterpoint to all of this is DACA. The program, which defers deportations for undocumented immigrants who arrived as children, was ended by Trump in September. And to this day, all demographics including Republicans say they prefer allowing “dreamers” to stay in the United States. About half of Republicans even favor allowing them a path to citizenship, according to Quinipiac's latest polling. The polling really hasn't shifted. The difference there is that Trump has professed a degree of support for the concept of DACA. But he says the program, which was enacted via executive action by President Barack Obama, was illegal and needs to be codified by Congress. That's somewhat the argument Trump is making on separating families. The administration has said repeatedly that this is merely its interpretation of the law — though it's an interpretation that not even the George W. Bush administration reached — and that Congress needs to pass an immigration bill that deals with it. Once again, Trump is essentially holding hostage something he claims to support in the hope of passing a broader immigration bill that funds border security and a wall. But it's not difficult to see Republicans, who already support separating families 55 percent to 35 percent, warming even more to that idea. DACA is not necessarily a deterrent to future illegal immigration, given that it addresses only those already here, but separating families at the border is supposed to be. If this is pitched as a zero-tolerance policy for those who would break the law and Trump truly owns the policy — it's worth noting that he has given conflicting signals on that — Republicans may rally to the cause. The fact that the media and Democrats are so vocally raising concerns about the policy is likely to exacerbate the rallying effect. And the controversy sure doesn't seem to have moved the needle on Trump so far. In fact, Gallup on Monday found Trump tying his record-high approval rating, at 45 percent. Republicans in Congress haven't exactly been forcing Trump's hand, despite clear reservations about the policy, and we probably shouldn't expect them to start now. Trump has his base behind him and a rising approval rating, and he has weathered these manmade storms many times before.